Acrylic balls are ideal for contact juggling. Machined and highly polished from optical quality material – free of internal distortions, and perfect for isolations. Tough, chip resistant and virtually shatterproof. Available in 5 sizes. We also carry Novus Fine Scratch Remover to polish out light scratches. #3500 2.50 in. Acrylic Ball - Clear $19.50 ea. #3501 2.75 in. Acrylic Ball - Clear $24.50 ea. #3502 3.00 in. 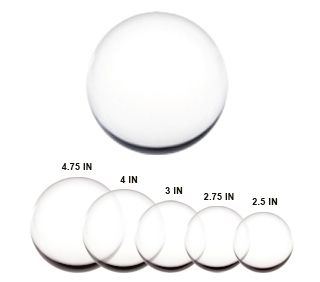 Acrylic Ball - Clear $27.50 ea. #3504 4.75 in. Acrylic Ball - Clear $80.00 ea.